This tutorial demonstrates how to stream new objects from a Cloud Storage bucket into BigQuery by using Cloud Functions. Cloud Functions is a Google Cloud Platform (GCP) event-driven, serverless compute platform, which provides automatic scaling, high availability, and fault tolerance with no servers to provision, manage, update, or patch. Stream data through Cloud Functions to let you connect and extend other GCP services while paying only when your app is running. This article is for data analysts, developers, or operators, who need to run near real-time analysis on files added to Cloud Storage. The article assumes you are familiar with Linux, Cloud Storage, and BigQuery. The following architecture diagram illustrates all components and the entire flow of this tutorial's streaming pipeline. Although this pipeline expects you to upload JSON files into Cloud Storage, minor code changes are required to support other file formats.The ingestion of other file formats isn't covered in this article. JSON files are uploaded to the FILES_SOURCE Cloud Storage bucket. This event triggers the streaming Cloud Function. Data is parsed and inserted into BigQuery. The ingestion status is logged into Cloud Firestore and Stackdriver Logging. Create a Cloud Storage bucket to store your JSON files. Create a BigQuery dataset and table to stream your data in to. Configure a Cloud Function to trigger whenever files are added to your bucket. Set up Cloud Pub/Sub topics. Configure additional functions to handle function output. Configure Stackdriver Monitoring to alert on any unexpected behaviours. Enable the Cloud Functions API. Create a Stackdriver Workspace. For more information about Workspaces, see Managing Workspaces. When you finish this tutorial, you can avoid continued billing by deleting the resources you created. See Cleaning up for more detail. In this tutorial, you use Cloud Shell to enter commands. Cloud Shell gives you access to the command line in the GCP Console, and includes the Cloud SDK and other tools that you need to develop in GCP. Cloud Shell appears as a window at the bottom of the GCP Console. It can take several minutes to initialize, but the window appears immediately. In the GCP Console, open Cloud Shell. Make sure you are working in the project you just created. Replace [YOUR_PROJECT_ID] with your newly created GCP project. Set the default compute zone. For the purposes of this tutorial, it is us-east1. If you are deploying to a production environment, deploy to a region of your choice. Clone the repository containing the functions used in this tutorial. To stream content into BigQuery, you need to have a FILES_SOURCE Cloud Storage bucket and a destination table in BigQuery. You create a Cloud Storage bucket that represents the source of the streaming pipeline presented in this tutorial. The main goal of this bucket is to temporarily store JSON files that are streamed into BigQuery. Create your FILES_SOURCE Cloud Storage bucket, where FILES_SOURCE is set up as an environment variable with a unique name. This section creates a BigQuery table which is used as the content destination for your files. BigQuery lets you specify the table's schema when you load data into the table or when you create a new table. In this section, you create the table and specify its schema at the same time. Create a BigQuery dataset and table. The schema defined in the schema.json file must match the schema of the files coming from the FILES_SOURCEbucket. Verify that the table was created. Now that you created the source and destination sinks, you create the Cloud Function to stream data from Cloud Storage into BigQuery. Parses and validates the file. Inserts the file's content into BigQuery. Logs the ingestion status in Cloud Firestore and Logging. Publishes a message to either an error or success topic in Cloud Pub/Sub. Create a Cloud Storage bucket to stage your functions during deployment where FUNCTIONS_BUCKET is set up as an environment variable with a unique name. Deploy your streaming function. The implementation code is in the ./functions/streaming folder. It might take a few minutes to finish. This code deploys a Cloud Function written in Python, which is named streaming. It is triggered whenever a file is added to your FILES_SOURCE bucket. Verify that the function was deployed. Provision a Cloud Pub/Sub topic, called streaming_error_topic, to handle the error path. Provision a Cloud Pub/Sub topic, called streaming_success_topic, to handle the success path. While data is streamed into BigQuery it is important to understand what is happening with each file ingestion. For example, suppose you have files that were improperly imported. In this case, you need to figure out the root cause of the problem and fix it to avoid generating corrupted data and inaccurate reports at the end of your pipeline. The streaming function, deployed in the previous section, stores the file ingestion status in Cloud Firestore documents so you can query recent errors to troubleshoot any issues. In the GCP console, go to Cloud Firestore. In the Choose where you store your data window, next to Native mode, click Select Native Mode. In the Select a location list, select nam5 (United States), and then click Create Database. Wait for the Cloud Firestore initialization to finish. It usually takes a few minutes. To provision a path to handle error files, you deploy another Cloud Function, which listens for messages published to streaming_error_topic. Your business needs determine how you handle such errors in a production environment. For the purpose of this tutorial, problematic files are moved to another Cloud Storage bucket to facilitate troubleshooting. Create your Cloud Storage bucket to store problematic files. FILES_ERROR is set up as an environment variable with a unique name for the bucket that stores error files. Deploy streaming_error function to handle errors. It might take a few minutes. This command is similar to the command to deploy the streaming function. The main difference is that in this command the function is triggered by a message published to a topic, and it receives two environment variables: the SOURCE_BUCKET variable, where files are copied from, and the DESTINATION_BUCKET variable, where files are copied to. Verify that the streaming_error function was created. To provision a path to handle success files, you deploy a third Cloud Function, which listens for published messages to the streaming_success_topic. For the purposes of this tutorial, successfully ingested files are archived in a Coldline Cloud Storage bucket. Create your Coldline Cloud Storage bucket. FILES_SUCCESSis set up as an environment variable with a unique name for the bucket that stores success files. Deploy streaming_success function to handle success. It might take a few minutes. Verify that the function was created. At this point, you have finished creating your streaming pipeline. Now it is time to test different paths. First, you test the ingestion of new files, then the ingestion of duplication files, and finally, the ingestion of problematic files. To test the ingestion of new files, you upload a file which must successfully pass through the entire pipeline. To make sure everything is behaving correctly, you need to check all storage pieces: BigQuery, Cloud Firestore, and Cloud Storage buckets. Upload the data.json file to the FILES_SOURCE bucket. Operation completed over 1 objects/312.0 B.
Query your data in BigQuery. In the GCP Console, go to the Cloud Firestore page. Go to the / > streaming_files > data.json document to verify that the success: true field is there. The streaming function is storing the file's status in a collection called streaming_files and uses the file name as the document ID. Go back to Cloud Shell. Verify that the ingested file was removed from the FILES_SOURCE bucket by the streaming_success function. The output is a CommandException because the file doesn't exist in the FILES_SOURCE bucket anymore. Verify that the ingested file is now in FILES_SUCCESS bucket. TOTAL: 1 objects, 312 bytes. The file name is used as document ID in Cloud Firestore. This makes it easy for the streaming function to query if a given file was processed or not. If a file was previously successfully ingested, any new attempts to add the file are ignored because it would duplicate information in BigQuery, and result in inaccurate reports. Note: To mitigate duplications, we recommend providing an insertId for each inserted row when streaming data into BigQuery. BigQuery remembers this ID for at least one minute, which works well for retries. If your system might produce a file with the same name in a larger than one minute interval, you must have another mechanism to ensure deduplication, such as Cloud Firestore. In this section you verify that the pipeline is working as expected when duplicate files are uploaded to the FILES_SOURCE bucket. Upload the same data.json file to the FILES_SOURCE bucket again. Querying BigQuery returns the same result as before. Meaning that the pipeline processed the file, but it didn't insert its content into BigQuery because it was ingested before. In the GCP Console, go to thee Cloud Firestore page. In the / > streaming_files > data.json document, verify that the new **duplication_attempts** field is added. Each time a file is added to the FILES_SOURCE bucket with the same name as one previously successfully processed, the content of the file is ignored and a new duplication attempt is appended to the **duplication_attempts** field in Cloud Firestore. Verify that the duplicate file is still in the FILES_SOURCE bucket. In the duplication scenario, the streaming function logs the unexpected behaviour in Logging, ignores the ingestion, and leaves the file in the FILES_SOURCE bucket for later analysis. Now that you have confirmed that your streaming pipeline is working and that duplications aren't ingested into BigQuery, it's time to check the error path. Upload data_error.json to the FILES_SOURCE bucket. Operation completed over 1 objects/311.0 B.
Querying BigQuery returns the same result as before. This means that the pipeline processed the file, but it didn't insert the content into BigQuery because it doesn't comply with the expected schema. In the / > streaming_files > data_error.json document, verify that the success: false field is added. For files with errors, the streaming function also stores an error_message field, which gives you detailed information about why the file wasn't ingested. Verify that the file was removed from the FILES_SOURCE bucket by the streaming_error function. Verify that the file is now in the FILES_ERROR bucket, as expected. TOTAL: 1 objects, 311 bytes. Running queries against the streaming_files collection in Cloud Firestore lets you quickly diagnose and fix issues. In this section, you filter all error files by using the standard Python API for Cloud Firestore. Create a virtual environment in your firestore folder. Install the Python Cloud Firestore module in your virtual environment. Visualize the existing pipeline issues. Deactivate your virtual environment when you finish your analysis. After you find and fix the problematic files, upload them to the FILES_SOURCE bucket again with the same filename. This process makes them pass through the entire streaming pipeline to insert their content into BigQuery. In production environments, it's important to monitor and alert whenever something unexpected happens. One of the many Logging features are custom metrics. Custom metrics let you create alerting policies to notify you and your team when the metric meets specified criteria. In this section, you configure Monitoring to send email alerts whenever a file ingestion fails. To identify a failing ingestion, the following configuration uses the default Python logging.error(..) messages. 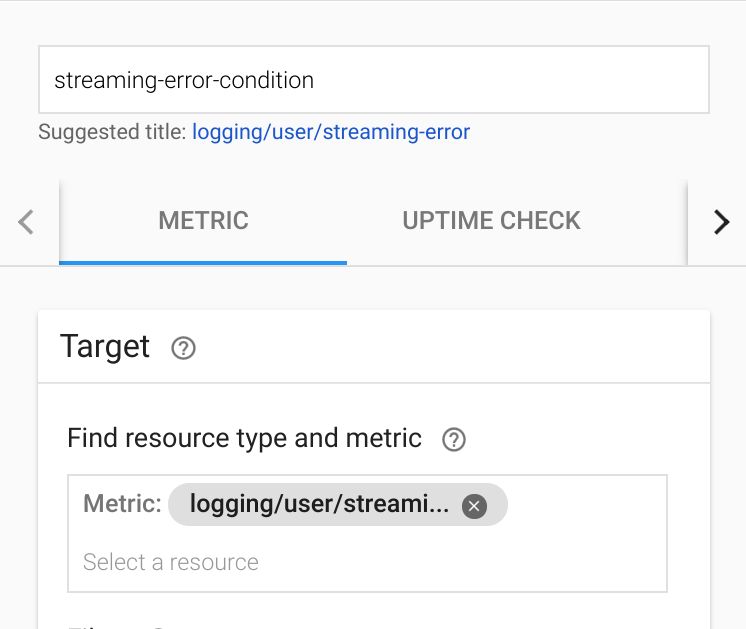 In the GCP Console, go to the Logs-based metrics page. In the Filter list, select Convert to advanced filter. In the advanced filter, paste the following configuration. In the Metric Editor, fill in the following fields and then click Create Metric. In the Name field, enter streaming-error. In the Label section, enter payload_error in the Name field. In the Label type list, select String. In the Field name list, select textPayload. In the Extraction regular expression field, enter (Error streaming file '.*'.). In the Type list, select Counter. In Monitoring, go to Create a Policy to create an alerting policy. In the Create a Policy window, complete the following steps. Complete the following fields, and then click Save. In the Title field, enter streaming-error-condition. In the Metric field, enter logging/user/streaming-error. In the Condition trigger If list, select Any time series violates. In the Condition list, select is above. In the Threshold field, enter 0. In the For list, select is above. In the Notification Channel Type list, select Email, enter your email address, and then click Add Notification Channel. In the Name this policy field, enter streaming-error-alert, and then click Save. After saving the alerting policy, Stackdriver monitors the streaming function error logs and sends an email alert every time there are streaming errors during a one minute interval. Review Events and triggers to learn other ways to trigger a serverless function in GCP. Visit the alerting page to learn how to improve the alerting policy defined in this tutorial. Visit the Cloud Firestore documentation to learn more about this global scale, NoSQL database. 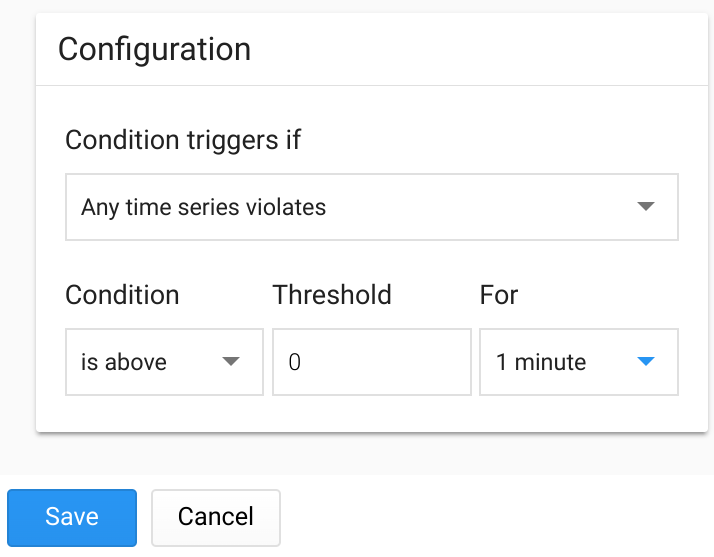 Visit the BigQuery Quota and limits page to understand streaming insert limits while implementing this solution in a production environment. Visit the Cloud Functions quota and limits page to understand the maximum size a deployed function can handle.